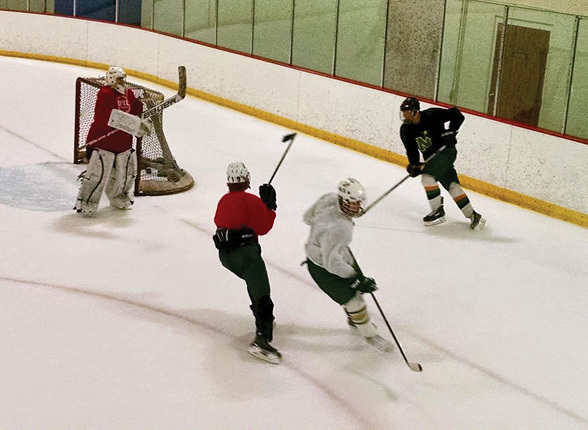 There’s a new sheriff in town for the Nashoba Regional ice hockey team but he’s no stranger to this squad. The Chieftains have handed over the reins to new head coach Trevor Short, who replaces Steve Kendall. Short has been involved with the Nashoba hockey program since 2006 as the varsity assistant coach and working with the junior varsity players. Short inherits a squad that finished last winter with a 10-8-4 overall record. Nashoba earned the fifth seed in the Central Mass. Division 3A Tournament and earned a first round victory over host and fourth-seeded Oakmont Regional. The season came to a close in the semifinals when they team fell to eventual Division 3A State champion North Middlesex Regional at the Wallace Civic Center. The Chieftains will have to contend with the departure of some key members from last year’s team. Nashoba lost six to graduation, including Devyn Levesque, who was a mainstay between the pipes as one of the top goaltenders in Central Mass. In net, Nashoba will turn to senior Luke Gilchrest and junior Charlie Lamplough. According to Short, Gilchrest is currently penciled in as the team’s starting puck stopper with Lamplough ready to go when needed. In front of the cage, the Nashoba blue line will be defended by players like junior Brad Colvin and sophomore Bobby Denaro. Juniors Joe Tavis, Joey Spallone, Colin McCormack and Colin Everton, along with sophomore Will Chapman, will also contribute on the defensive end. Up front, the Chieftains scoring attack will be led by the top offensive line of seniors Kevin Gilchrist, Hunter Boudreau and Jack Charbonneau. The second line will consist of sophomore Mike Magliozzi, junior Matt LeBlanc and classmate Devyn Barrett, while the third line isn’t set in stone. According to Short, he will turn to PJ Anastas and Dean Anastas, with the third spot still up in the air. The Chieftains will have a plethora of captains this winter season; five to be exact. Nashoba will look to Brad Colvin, Kevin Gilchrest, Jack Charbonneau, Hunter Boudreau and Luke Gilchrest to carry the torch. For Short, two games that were circled on the calendar the day the schedule was released were the two battles with Lunenburg High School. Short’s bother, Eric Short, is the head coach of the Blue Knights and when the two squads collide, it should add some excitement to an already intense rivalry. The Chieftains enjoy the comforts of home in the early portion of their schedule as four of their first five games are at the New England Sports Center. After an opening night tilt with the Red Raiders on December 20, Nashoba welcomes Oakmont on December 22, Assabet Valley Tech on December 27 and Grafton on New Year’s Eve before hitting the road for eight of its next nine games.